Kahirei xarnashpoti mej, aghmuki, husahatutyan u qaghaqayin xjdjutyan mej harnum e Lara Baladii installatsian` huysi ashtarak. Installatsian karmir xchaqarits chartarapetakan karuyts e, vori miayn exteriern e kangun. Aveli shut ayn kisakaruyts e` inchpes Kahiren ayn bolor kisakaruytsnery, vor shrjanakum en qaghaqy, ev voronq li en anhraverq bnakichnerov` Kahirei metsamasnutyuny kazmogh ayn mardkantsov, ovqer goyutyan ayl mijots chunen, qan huysy. Karuytsi mej haytnvelov` handisatesy karogh e hangstanal dzaynayin installatsiayi hnchunnerits u verjapes haytnvel 20 mln. bnakich unetsoghays qaghaqum aydqan anhnar andznakan mekusatsman u arandznutyan mej. “Waiting for Tables” is a lyric essay about the Armenian and Turkish communities in Sunnyside and Woodside, Queens. After moving to Woodside in 2007 and discovering Turkish and Armenian restaurants and groceries, not to mention corresponding communities, Agabian set out to discover the relationship between two nationalities historically at odds with each other, mashed together in a tiny neighborhood in New York City. This is a first-person account about life and death, the reality of immigration, and neighborhood diplomacy. The reading takes place on Saturday, May 2, 2009, 3pm at TOPAZ ARTS. A question-and-answer session will follow the reading. Refreshments will be served. TOPAZ ARTS is located at 55-03 39th Avenue in Woodside, Queens. Subway directions: #7 train to 61 St. or the R, V, G trains to Northern Blvd. Nancy Agabian is the author of Princess Freak, a collection of poems and performance texts on her bisexual coming-of-age, and Me as her again, a memoir of her Armenian-American family. Her writing has appeared in numerous anthologies and journals, including Birthmark: A Bilingual Anthology of Armenian-American Poetry, Hers 2: Brilliant New Fiction from Lesbian Writers, and KGB BarLit. A Fulbright scholar to Armenia for 2006-07, she's currently working on The Fear of Large and Small Nations, a book about nationalism, corruption, family and freedom in post-Soviet Armenia. Nancy lives in Astoria and teaches writing at Queens College and at the Gallatin School at NYU. For more info about the author, please visit www.nancyagabian.com. This summer she will lead “Our Side”, a creative nonfiction workshop on cultural identity at TOPAZ ARTS – applications are available at http://www.topazarts.org/. “Waiting for Tables” is made possible in part with funds from the Decentralization Program, a re-grant program of the New York State Council on the Arts, administered by the Queens Council on the Arts. Judith Butler presents from her forthcoming book from Verso, Frames of War: The Politics of Ungrievable Life. Butler explores the way that recent US-led wars have enforced a distinction between those lives that are recognized as grievable, and those that are not. Extending the argument of Precarious Life (Verso, 2004), Butler argues that process of differential grieving is enacted through media forms that have become part of the very waging of war. This situation has led to the first-world destruction and abandonment of populations who do not conform to the prevailing norm of the human. When I sent my abstract for acceptance to this panel several months ago, I had a clear position I wanted to articulate. The memories of WOW’s first exhibition – Coming to You Not to Be With You in Yerevan still fresh, I wanted to retrieve the experience of doing collective work with artists and writers within the framework of this exhibition. I wanted to construct an inter-subjective topography of the exhibition we organized together in the summer of 2008 in Yerevan. What I had in mind was to recuperate this collective experience of labor, precisely the experience of producing art as a laborious collective process which resulted in an intersubjective exchange between the participants, this in turn, having emancipating consequences for the production of the aesthetic experience. I wanted to bring in the experience of working together with artists and writers within the framework of WOW as constitutive of a possible/impossible collective, which functions through dissensus rather than consensus, a collective which came into being through a dialectic of reunion and partition, through aggressive gestures to call the other to share a common space, and through an equivocal refusal to share that space, reflecting vulnerability and fragility at the very heart of the subject. 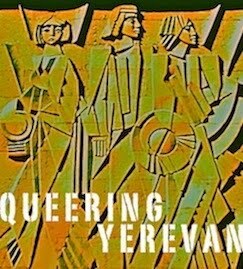 As the temporal distance from the original event increased, I felt the need to not only question and critique my own role in the construction of queer discourses and identitarian associations in Armenia but also to interrogate the very possibility of subjectivisation within the dialectic of reunion and partition. What if subjectivisation fails? What if adapting pre-established and predefined regimes of identification and identitarian associations developed under radically different historical conditions results in the impossibility of subjectivisation? My goal here is to conceptualize the space and some of the possibilities which emerge between the attempts of subjectivisation and its very failure, on the example of WOW’s exhibition Coming to You Not To Be With You. Throughout my presentation I will then construct a different topography, not that of subjectivisation but non-subjectivisation, not that of desire within the construction of collectives and communities but the impossibility of desire. This multi-layered narrative is comprised of factual information about WOW as a collective –the modes of communication and interaction which might or might not result in collectively coming together, my own commentaries derived from my subjective experiences within the group and my political commitments, other voices-fragments of speeches, utterances, visual references, which participate in the formation of the collective, the theoretical framework I am adopting for my interpretation and finally, a meta reflection upon the very narrative of writing, which I call a topographical curating as a way of reading art works and constructing an aesthetic experience through the very work of interpretation. WOW-Women-Oriented-Women’s loose network was established in 2007, or rather it was never established since it has mostly functioned through networks of virtual communication- blog and a list-serve, materializing only from time to time, situationally. It is comprised of more than a dozen of women artists, writers and activists who live in Armenia or the Armenian Diaspora- and namely, Canada, USA and Egypt. The collective is focused on women’s issues – starting from the questions of women’s rights and excavating and reviving untold stories of women artists, intellectuals and activists to creating new visual codes for artistic production. 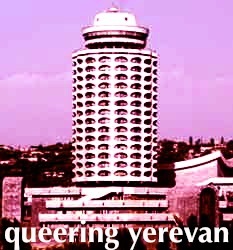 The umbrella project under which its initiatives are grouped is entitled “Queering Yerevan”, which functions through double-problematization: complicating the given spatio-temporal coordinates within the urban structure of the Armenian capital and problematizing the word queer. Though with some lapses to the perils of identity politics, the word queer has been largely taken to denote a specific perspective, an estranging look which sheds a different light upon already familiar phenomena, rather than gay and lesbian identity. At times, members come from radically different backgrounds: there are those who were born and live in Armenia where homosexuality has not been a part of mainstream or even marginal discourses until very recently, those who were born and grew up in Armenia but are now located elsewhere, such as myself, those who are second or third generation immigrants in North America and also those who grew up in the Diaspora but have expatriated to Armenia during the last 5-6 years. Given these different historical and cultural backgrounds of its members, the very structure of WOW calls for a community which does not pursue a collective agenda and is not united by a single cause. The diverse backgrounds of its members makes it impossible to identify the collective’s agenda in narrowly defined terms. While the local Armenian artists evolved throughout the late 1990s and 2000s, established friendships, produced works and exhibited together without any discourse of homosexuality or queerness informing their works, those members who grew up in North America often contribute through clearly defined politics of identity –be that of national or gender identity. At times the group communication becomes a struggle to obtain the right to name and frame the group’s “true and authentic” politics and to outline its agenda, to create cohesion and identity. However, these attempts are constantly renegotiated and contested within the group itself. Then, the collective is a space of contestation of meaning and signification, and by extend, ultimately a space of power struggle. As long as this struggle is ongoing without arriving at a consensus, it is possible to work, think and discuss together. 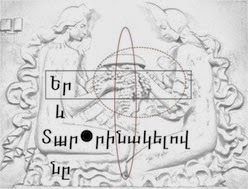 As someone who lived in Armenia and closely worked with local artists but is also participating in the academic discourses of identity politics within the Anglo-Saxon academia, I try to forge relationships within the group, connections and disconnections that would go beyond the politics of identity, or the West’s obsession with identity discourses. I believe that in the specific context of Armenian artists’ communities the politics of identity as formed within Western Europe and especially North America is an alien discourse which, if imported unconditionally, can have dire consequences for contemporary artists’ and other marginal communities subjectivisation within the mainstream culture. These discourses threaten to ultimately form a coherent “us”-appearing as the progressive peripheries against “them” (the mainstream culture)—defined as regressive and conservative. Thus this oppositional dynamic reinforces center and periphery, margins and mainstream division, legitimizing the dominant culture as a “core text”. (In Foucauldian terms, opposition rather than resistance to power, turns into an opposition in service of power ) I believe that in the specific context of Armenia marginal communities can not afford to detach themselves from the dominant culture – for cultural, social as well as economic reasons. Any act of detachment and fragmentation through particularization of identities could result in the atomization, enclosure and alienation of communities and abandoning the struggle over representation. Here I am not arguing for unity and consensus but for antagonism and dissensus which is resistant and subversive, it is not a detachment, yet – not an attachment and identification. I believe that the artistic subjectivisation, if it is to offer any empowerment for these communities and if it is understood as a process of dissociation and disindetification rather than identity and recognition, can open up a space for a truly emancipatory politics through aesthetics itself, rather than through an overarching political cause. My own utopian politics within WOW is to salvage it from falling a pray to identity discourses or becoming yet another tool to advance progressive politics. 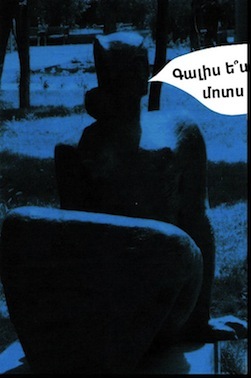 On the one hand, there is the seduction to be packaged and exoticized as Armenian-women-queer, represented and entered into the economy of desire conditioned by the functioning of the international art market, and on the other hand, being instrumentalized by international funding bodies, civil society groups or progressive politics to advance a specific identity cause. I approach WOW first and foremost as an aesthetic community rather than a community which shares a common political cause striving for identity and recognition. I believe that by precisely defining it as an aesthetic community it is possible to salvage its truly political potential. I am also well aware that this definition is not merely a conceptualization or interpretation of the collective but an attempt to frame it, to direct its orientation and have an impact upon its politics. I hold that what aesthetics and anti- or beyond identitarian politics share is a possibility of political subjectivisation through aesthetics and by extent, if we remember Rancier’s Apart We Are Together, through disidentification. According to Rancier, “The aesthetic effect first is an effect of des-identification. The aesthetic community is a community of des-identified persons. As such, it is political since a political subjectivization goes through a process of des-identification”. I would like to extend Rendell’s critical model and apply it to curating. More than anyone else, the curator’s prime occupation is with positioning works in a specific space; the latter not only understood as a specific architectural configuration but also as a historical field in which meaning is constructed and contested. Then, the curator is not someone who is external to the art works or someone whose task is to bring out and show the artist’s implied meaning but someone who engages the aesthetic language of the art works, assembles them, rearranges, rewrites and re-interprets in order to produce a space for experience: a space filled with and constructed by other bodies: coming together, staying apart, appearing and disappearing, both ephemeral and material. In a way, the topographic curating can happen in a given space and time, "really", but it can be also constructed post-factum, and each time differently, but always working with the spatial coordinates of specific works within a specific space and the curator’s subjective engagement with these works. The project Coming To You Not to be With You is a topography of failed desire, the impossibility to stay together as a community, relentless attempts to construct a common space and the impossibility to share that space. It abandoned the notions of visibility, while being the first project in Armenia to bring together works of lesbian, bisexual and heterosexual artists in relation to queerness or I would rather call it estrangement, since this implies a double translation – queer into the Armenian word –տարօրինակող and back to the English word estrangement,. It’s a topography of a failure to come out, to open up, to be or to become queer; a topography of enclosed and isolated spaces –empty constructions, of the obsessive attempts of re-territorialization. 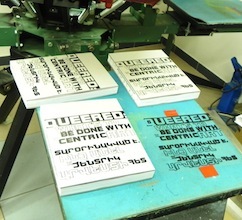 It is not accidental that the title Coming to You Not To Be With You replaced the original conception of the project: Self-Mapping: Queering the City; the latter being an umbrella concept for WOW’s activities in general, a kind of mission statement. The original conception was about opening the self to experience the city as a phantasmic geography, to map it through personal memories, sites of encounter, coming together and breaking up, though the possibility of subjectivisation. I walk through the garden where Coming to You Not To Be With You took place, as a participant-curator, as an accomplice, as a critic, as an outsider, as a friend. I mentally walk through the garden while physically located in my apartment in Cairo, with a distance of eight months from the original event. 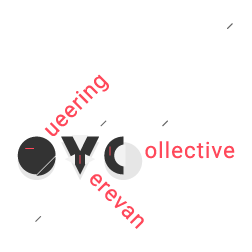 This is an imaginary walk, affected by the current politics of WOW and my personal interest to shift the orientation of the group from identity discourses to creating possibilities for a truly emancipatory politics through an aesthetic experience. I try to look for answers and possibilities in the summer exhibition, the only physical, non-virtual instance in which the collective came together not only to produce art but to labor together, to forge bonds and relationships through work. This included discussions, cleaning of the garden with shovels and hoes during the hot summer, smoking way too many cigarettes and consuming too much caffeine. I look back with the hope of finding an emancipatory potential in the collective’s coming together through a common aesthetic experience as a shared space rather than forging bonds through the politics of a common identity. In the middle of the garden, after stepping over the disappearing traces of Astghik Melkonyan’s performance, passing through Adrineh Boghossian’s fragments of the photographed self, Lusine Chergheshtyan’s almost hidden and barely visible attempts of bodily communication and without reaching the crowed who came to the opening and is attentively following to Shushan’s and my conversation, I come across an abandoned house that has been there for a thousand and one years. The half-ruined construction from another age, a decadent monument to the impossibility to remember the past as it is. This work by Arpi Adamyan and Lusineh Talalyan is an anti-monument, which mourns without remembering, a ready made-ornament with a vague and undefined sense of loss, but without memory. 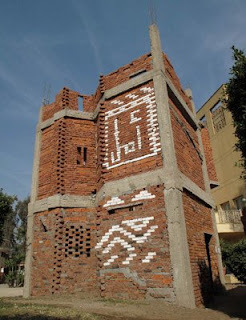 Its an assemblage of a ready-made anti-monument and a technological intervention in order to revitalize the space, to invite the viewer in, but without any success. The past is so obscured that it resists any work of reconstruction. I can enter the space through the semi-decayed window frame and the collapsing front door: however, this entry never takes place through invitation; it is too dangerous to enter this space – both literally and figuratively. This is a useless space, which calls in but does not accommodate, which refuses recognition and identification; it is not an abject space in which the residue and waste of society can nourish a potential to undo dichotomies but a space which is full of void and emptiness, which can not be utilized and reused and in which any meaning or signification collapses. 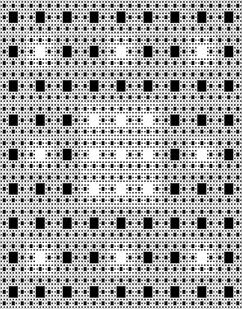 The space closes itself off rather than invites in – it refuses to incorporate the reality coordinates of my everyday life, and by this fact, it is a phantasmic space which refuses symbolization, thus subjectivization. Within the space of the exhibition – inhabited with works, inhabited with other bodies and meaning, the empty room appears as a cavity, as a wound, as an abyss which does not promise redemption. This is a space of total disindetification, epitomizing the very impossibility to relate to the other, to identify with the other. This is not a space of dialogue and reciprocity but of isolation and solitude. While Shushan and myself introduce our collective and the exhibition to the audience, this work simultaneously cancels our utterances. In the way of being a space of dissensus, this is an aesthetic space par excellance, and by extent – this is an estranged (queer) space in that it destabilizes the look and cancels signification. However, paradoxically, as Rancier claims: “Constructing a place for solitude, an ‘aesthetic’ place appears as a task for engaged art” – in that it offers a radically emancipatory distribution of the sensible which creates ruptures and discontinuities within the everyday sensorial regime.